Arch Canyon, on the west side of the Ajo Range in Organ Pipe Cactus National Monument is named for a 90 foot wide arch near the top of the jagged, reddish cliffs enclosing the drainage, about 600 feet above the valley floor. Close inspection reveals a separate, much smaller opening above the main span, making this a rare example of a double arch. The feature is visible at the start of the 0.7 mile Arch Canyon Trail, but soon becomes hidden behind other parts of the cliffs, as the official path climbs gently up the wide lower reaches of the canyon, ending at the foot of a narrow, steeply sloping, south-side tributary ravine, though an unmaintained trail continues, rising another 800 feet over half a mile across rocky or gravelly slopes to a saddle above nearby Boulder Canyon. 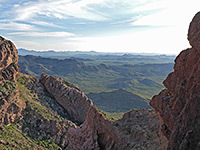 Still the arch is out of sight but the views are spectacular, across the vast plains of the Valley of the Ajo, and the irregular peaks and cliffs of the Ajo mountains. The round trip to the viewpoint is only 2.6 miles but takes at least two hours because of the steep and rough terrain. Besides the views and the rock formations, one other feature of the hike is the variation in vegetation, from large cacti (saguaro and organ pipes) on the valley floor to bushes and grass on the saddle, accompanied by a good number of wildflower species. Late afternoon is the best time for the trip as on sunny days, the rocks take on a very deep, rich red color. Organ Pipe Cactus National Monument map. 21 views of Arch Canyon; gallery, slideshow. 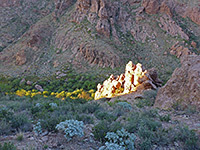 Like all trails in Organ Pipe Cactus National Monument, the route up Arch Canyon begins along one of the unpaved backcountry roads, in this case the Ajo Mountain Drive; the trailhead is 9 miles along the road, about a half hour journey from Hwy 85. Most of the road is one way, bumpy and stony, though some sections are paved including about 2 miles across the undulating terrain of the Diablo Mountains. The trailhead (and picnic area) for Arch Canyon is just beyond this section, at the northernmost point along the drive. 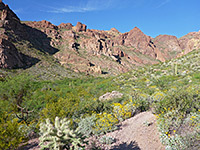 Views from the trailhead are of hills in most directions including the Diablo Mountains west and south, and the higher peaks of the Ajo Range to the east. At the parking area are various notices including a map, and warnings about hiking in the desert. The arch can be seen ahead, half a mile away - at the end of a ridge perpendicular to the south side of the canyon, which is bushy and overgrown along the creek bed so the trail stays a little way above, on the south side. The route heads towards the arch and remains within sight for a short distance, until the span becomes obscured by rocks just beneath. 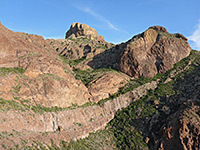 The path climbs gradually round a little gully and across boulder-covered hillsides, generally about 50 feet above the canyon floor, and reaches a junction after 0.7 miles (the end of the maintained trail), at a point just beyond the base of the ridge containing the arch, and 400 feet below. To the left, an unofficial path continues up the canyon, marked by a notice warning of the dangers posed by smugglers. At least another half mile of the ravine can be explored relatively easily, but the more popular option is the right branch of the trail, which climbs into the mountains. A second notice advises of steep and unstable slopes ahead. The climb starts up slickrock, and around a rocky hollow beneath vertical cliffs, followed by a longer, straighter ascent, rising above the ravine to the east, sometimes crossing other little drainages. Although unmaintained, the route is marked by many cairns and seems well used. 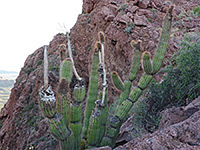 The ground becomes less steeply sloping just below a saddle, where the surroundings are mostly brown or red rock, covered by yellowish lichen, with lots of ocotillo and small cacti. 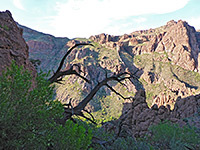 The trail passes over the saddle to the rim of the big gully of Boulder Canyon, lined by wide, banded cliffs, then veers west along a ridge, across a neck between two steep ravines (one containing an aged organ pipe cactus, at 3,700 feet right at the upper limit of the elevation range for this species) and on to the edge of a flat promontory, beyond which the land falls away near-vertically down to Arch Canyon. This is the best viewpoint along the trail, overlooking the desert plains, the path below and even the top of the arch; although the opening is not in view, the small secondary span can just be seen. The arch itself is apparently only reachable with use of ropes.